Taigh Mairi Anndra is a traditional thatched cottage nestled away in the tiny village of Northglendale, Isle of South Uist, Outer Hebrides. Situated on a traditional working croft, Taigh Mairi Anndra is the perfect get away destination if you wish to enjoy a romantic vacation, to explore the islands and its stunning scenery or simply to relax and unwind. This cottage is set on the eastern side of the island; it has stunning views with hills to look at from all around and a view of the shore going out to the Minch. South Uist is unique in the fact that the east side is rocky and craggy and the west side lined with white sandy beaches, carpeted by wildflowers growing on the Machair with only the vast Atlantic ocean to separate you from the rest of the world. The beach is just a 10 minute drive from the cottage. Taigh Mairi Anndra is also well known due to Margaret Fay Shaw the famous Gaelic folklorist and collector of traditional Gaelic music. Whilst residing in South Uist she lodged with the MacRae sisters Peigi & Mairi MacRae in this cottage. Margaret Fay Shaw collected and transcribed Gaelic songs from South Uist, and from 1929 until 1935 she learnt Gaelic from the MacRae sisters and wrote down songs that the locals taught her. The material collected in these years were published later on and can still be purchased today. 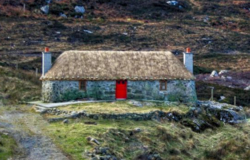 Taigh Mairi Andra is a one bedroom luxury thatched cottage. It has a traditional thatched roof made from rushes and built with its original stone walls. Inside the cottage consists of an open plan kitchen/living room with a bathroom and one bedroom. Facilities include a washing machine and tumble dryer, fridge freezer and oven in the kitchen, outdoor washing line, electric heating throughout the cottage, a bath and shower, TV, DVD player, Sky, and WiFi coverage. If you wish to have something ready for you when you arrive eg milk, bread, tea, coffee etc please email before hand and we will have these items ready for your arrival (if you wish to have some shopping delivered the amount will also be added to your balance). Pets are permitted but on request only, please contact us before booking. A deposit of £100 to be payable on booking and the balance settled one week before arrival.